If you miss making a payment, you will be notified by the system that your Kanbanize subscription has expired and you need to renew it in order to continue using the service. You will be able to access your account, but you will not see your Workspaces and boards. Still, you will be able to export your data from the Advanced search tool in Kanbanize. 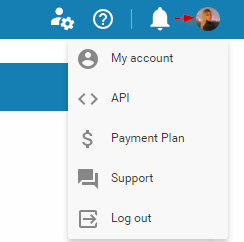 - click on your avatar at the top right side of your board interface -> select Payment Plan from the menu. 2. What to do if your payment failed? - Your credit card has expired. - There are not enough funds available to process the transaction. - Your bank has to approve the transaction request in order for your purchase to be completed. Please, check your Credit card or/and contact your Bank for more details. Your account will be stored 3 months after the expiration date, but it will be locked. Users will still have access to the Advanced search tool that allows them to export account data in Excel spreadsheets, but they will not be able to use the system. During that period, users with "Account Owners" or "Make Payment" privileges can re-activate their accounts and renew the subscription. All they need to do is access their account and use the Payment panel. The account setup will be preserved as it was prior to the cancelation. Note: If you don't want to renew your subscription, your data can be removed right away on demand - please contact us at support@kanbanize.com.